Two major new pieces of advanced welding equipment are now available for collaborative research and development – a powerful diode laser cladding facility, and the largest electron beam welding chamber in the UK. The Nuclear AMRC’s new diode laser cladding cell features a 15kW Laserline fibre-coupled diode laser, controlled by a gantry-mounted robot arm. Diode laser cladding uses a powerful laser to rapidly coat large areas of metal with a high quality layer of speciality alloy. Currently used in the aerospace, automotive and offshore industries, it can potentially revolutionise the production of pressure vessels for the civil nuclear sector. Compared with current methods used to clad vessel interiors, such as conventional wire or strip cladding, diode laser cladding can cut production time from weeks to hours. 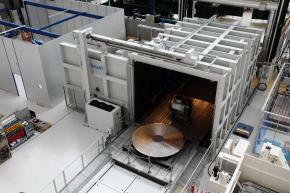 The Nuclear AMRC’s diode laser facility is capable of working on pieces of up to three metres diameter. It can deposit stainless steel, nickel alloys, wear-resistant alloys and other specialist cladding material at up to 10kg per hour. Initial research focusing on proving the viability of diode laser cladding for civil nuclear pressure vessels. The cell will also be available for collaborative research and development for other industries requiring large-scale surface enhancement. The Nuclear AMRC has also begun operations on its Pro-Beam K2000 electron beam welding chamber, which was handed over in March following a 10 month installation and commissioning process. With a vacuum chamber volume of 208m3, over 80 times the volume of the centre’s established K25 chamber, the K2000 is believed to be the largest e-beam chamber available for research anywhere in the world. Engineers and executives from Pro-Beam and UK agents Vacuum Furnace Engineering joined welding specialists from Rolls-Royce and the Nuclear AMRC to toast the handover. The Pro-Beam K2000 can complete very intricate joins on large components using nine axes of movement – four for the component and five for the electron gun. It can be used to weld gas turbine parts up to three metres in diameter, with fully automatic joint following and variable thickness programming – capabilities found in only a handful of machines worldwide. Electron beam welding can join very thick metal sections with a single weld, potentially cutting the time required to join nuclear pressure vessels from weeks to hours. 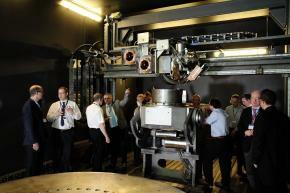 The Nuclear AMRC team has already demonstrated a 100mm thick weld on the smaller K25 chamber. 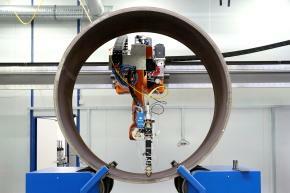 Find out more about our welding and cladding research capabilities. For more on our latest capabilities and research projects, see the Nuclear AMRC Newsletter. Nuclear UK is a major strategic leadership forum organised by industry, for industry. It is part of the International Festival for Business 2014, the UK’s most significant global trade and investment showcase in more than 60 years. 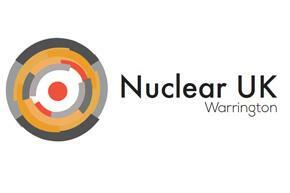 Nuclear UK will feature high-calibre speakers representing the new-build and decommissioning sectors and the science, technology and skills arenas. Confirmed speakers include John Hutton of the NIA, John Clarke of the Nuclear Decommissioning Authority, Mike Tynan of the Nuclear AMRC, and key figures from EDF Energy, NuGen and Westinghouse. Also in the International Festival for Business, Mike Tynan will present at the Made in the UK conference in Liverpool on Monday 21 July. And the AMRC Training Centre is hosting the Global Manufacturing Festival on 24-25 June, including an advanced machining seminar on Tuesday 24. Toshiba and Westinghouse will invest over £200 million into three new reactors at Moorside, West Cumbria. The figure was announced by UK prime minister David Cameron after a meeting with his Japanese counterpart Shinzo Abe. “Today we can announce the huge investment being made by Toshiba and Westinghouse – over £200 million – into the rebuilding of the British nuclear industry, specifically in the North West of our country, in a project that could provide as many as 14,000 jobs during the construction phase, and many thousands of jobs ongoing, as well as providing low-carbon, base load electricity for Britain,” Cameron said. The Nuclear Decommissioning Authority (NDA), which owns the proposed development site close to current facilities at Sellafield, announced that it had agreed terms with development group NuGen – a joint venture between Toshiba and GDF Suez – to update and extend the land option agreement. 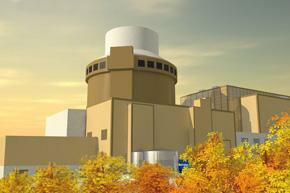 Toshiba plans to build three Westinghouse AP1000 reactors at Moorside, with the first online in 2024. The UK and Japanese leaders highlighted nuclear energy as a key area for cooperation between the two countries. A joint statement recognised the importance of “investing in a diverse, efficient and clean energy mix in order to ensure long-term security of supply and emissions reductions” and said the two countries will “continue to maximise the opportunities for UK–Japan commercial partnerships in low carbon goods and services”. The statement also announced the creation of a new UK–Japan civil nuclear joint research fund, and a related working group on nuclear energy research.